Welcome to Spanish For Fun with Angie and Ainara in Greenwich. We offer classes at 2 levels - Beginners and Improvers. Our lessons are fun and lively. You learn in small groups with no pressure, no compulsory homework and no assessment or exams. There is a of focus on communication and lessons are created for adult learners only. If you're not sure what level you are we will be happy to assist you in deciding which is best. The evening classes are in Greenwich Village. All the details are below. You might be interested to know a bit about me! I am a native French speaker, originally from Mauritius and I have always worked in the French beauty industry, including for Chanel and Avon. Seven years ago I decided to pursue my passion for the French language and became self employed. First of all I began teaching children from the ages of 5 to 11 years old which I am still thoroughly enjoying but I found there was a lot of demand from parents wishing to learn the language in order to help their children as well as become better at French themselves. 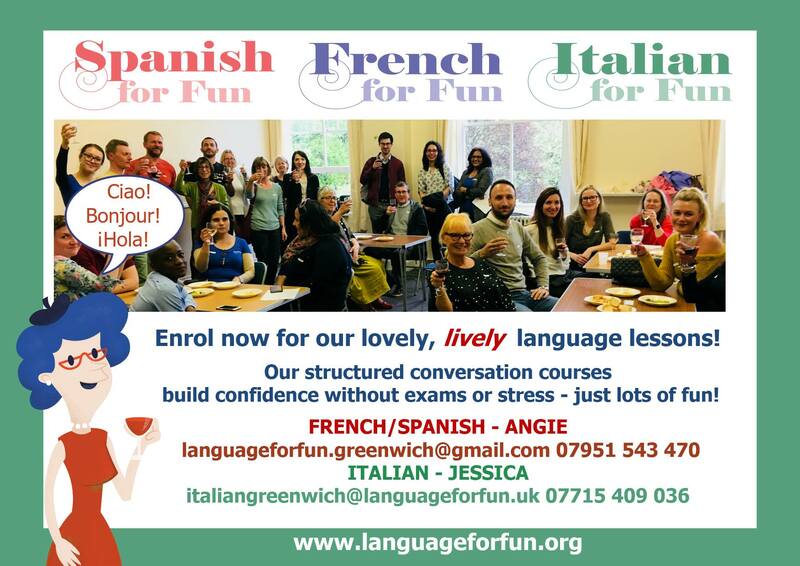 It was this that encouraged me to set up language classes for adults and now I'm not only lucky enough to enjoy sharing my love for French with children but also with adult learners.